Beautifully engraved certificate from the Pennsylvania Railroad Company issued in 1931. This historic document was printed by the American Banknote Company and has an ornate border around it with a vignette of Penn Station in New York. This item is hand signed by the Company’s President and Secretary and is over 74 years old. 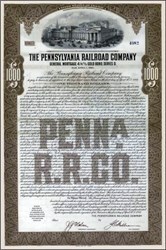 The Pennsylvania Railroad Company was chartered in 1846 and began construction soon afterwards. In 1856 it had completed a track to Chicago. By the end of the 19th century the Pennsylvania Railroad Company had expanded to St. Louis, Missouri, and Cincinnati, Ohio, in the west and to New York City, Washington, D.C., and Norfolk, Virginia, in the south and east, ultimately becoming a 10,000-mile system. Prior to the late 1940's the company prospered but by the 1950's it was losing considerable money annually. In 1968 the company merged with the New York Central Railroad and created Penn Central Transportation Company, which later absorbed the New York, New Haven and Hartford Railroad Company. However, losses continued and the company filed bankruptcy in 1970. The company's holdings have since been split among Conrail and Amtrak.